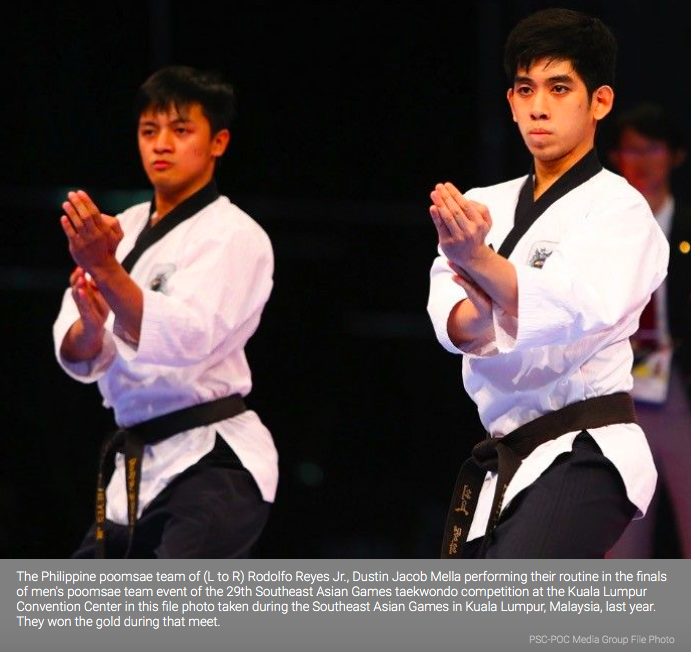 JAKARTA – The Philippine taekwondo jins brandished the very form that have made them touted bets in poomsae event in regional and world levels, striking a pair of bronze medals as action in the 18th Asian Games kicked into high gear in various venue here and in the city of Palembang in South Sumatra province on Sunday. Rodolfo Reyes, Jr., Jeordan Dominguez and Dustin Jacob Mella formed the men’s team while Jana Dominique Oliva, Rina Babanto, and Juvenile Faye Crisostomo composed the distaff side that got the Philippines to the medal board the day after the colossal opening ceremony of the quadrennial games at the Gelora Bung Karno Sports ComplexSaturday night. Over in Palembang, the Philippines saw worthy showings from trap shooter Hagen Alexander Topacio and netters Jeson Patrombon and Francis Alcantara. A number of Filipino bets got off to a losing start, including the volley belles who dropped their first match to old tormentor Team Thailand, 25-22, 25-12, 25-15. Wrestler Alvin Lobrequito, a bronze medal winner in the Asian Indoor-Martial Arts Games in Turkmenistan last year, didn’t make headway here, losing his first match against Uzbek Makhmudjan Shavkatov, 2-11, in men’s freestyle 57kg. Meanwhile, cyclist Marella Vania Salamat was out without seeing action as she was disallowed by the UE College of Dentistry a leave of absence from her studies. China and Chinese Taipei had split the first two gold medals in the games before the Philippines joined the host country, Korea, Iran, Vietnam, India, Malaysia and Thailand in getting to the medal tally. Indonesian President Joko Widodo was in the gallery as the Philippines made a pair of podium finishes in poomsae at the Jakarta Convention Center. The men’s team bested Saudi Arabia 8.18-7.64 in the Round of 16 before topping Iran 8.33-8.10 in the quarterfinals for an outright bronze medal feat. The women’s team was not to be outdone, topping Hong Kong 8.00-7.49 in the Round of 16, then narrowly beating the host team, 8.07-8.04 to also book a semis slot. But both settled for the bronze as Reyes, Dominguez and Mella were outperformed by their Chinese rivals while Oliva, Babanto and Crisostomo were humbled by their Korean foes, 8.020-7.110, in the semifinals. Reyes missed what could have been another bronze in the men’s individual poomsae as he was topped by Thailand's Pongporn Suvittayarak, 8.08-8.32, in the quarterfinals. He showed up Kazakh Ruslan Manaspayev 8.08-7.08, in the Round of 16. Out right in the first round in women’s individual event was Jocel Lyn Ninobla who lost her Round of 16 match to Vietnam's Tuyet Van Chau, 7.89-8.11. Topacio provided bright moment with his 71 out of possible 75 points in the first three rounds of men’s trap shooting. He stands at joint third, a point off two joint leaders going into the last two rounds of the qualifying today. Patrombon advanced to the second round in both the men’s singles and men’s doubles in tennis. The 25-year-old Iligan native bundled out Guzmao Fernandez of Timor Lester, 6-4, 6-2, in singles, then paired with Francis Alcantara in a 6-4, 6-2 win over a Qatari tandem in the doubles. Marian Jade Capadocia drew first round bye in ladies singles. In cycling, the Philippine federation and the Philippine Olympic Committee (POC) slammed UE College of Dentistry officials for refusing to allow Salamat to compete here. “The decision of the UE College of Dentistry not to allow cyclist Marella Salamat to take a leave of absence is deplorable,” said POC president Ricky Vargas said in a statement. Countless efforts initiated by PhilCycling President Rep. Abraham Tolentino and even officials of the Philippine Sports Commission to persuade Salamat to race in women’s road race fell on deaf ears. “Salamat is a medal potential who wanted to compete for flag and country. This puts in question the sense of nationalism of an educational institution which has been known for its long history of Filipino sports heroes,” Vargas said. “We are disappointed with this decision,” he stressed.